This 2 and half day workshop is aimed at giving you a foundation for your acting that is alive and happening in the moment. We will train the necessary skills to be truthfully engaged and open to receive to react in the moment. You will experience transparance and freedom in your acting while being connected to your emotions. 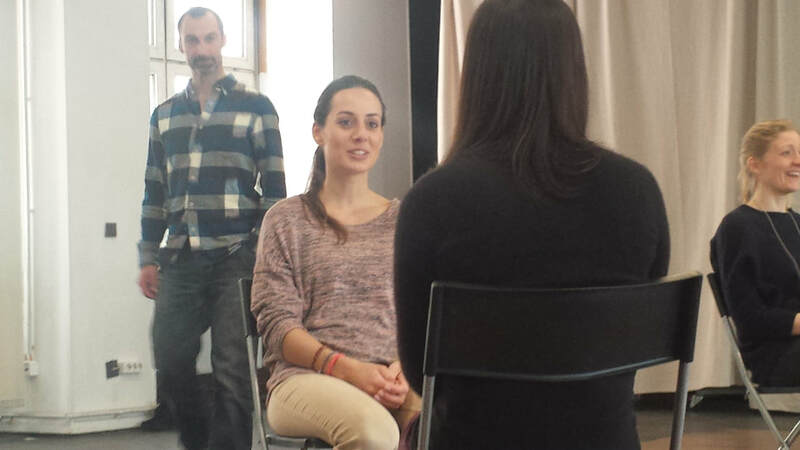 This wekend is an introduction into the Meisner-Training and we will practise the fundamental qualities in every good acting experience: listening, reacting from your true impulses from one moment to the next. Towards the end we will look at how that applies to scenework: the reality of doing under imaginary circumstances. This 8-week-Intensive runs parallel to the Year-long-Program (see year-long) and provides you with some of the essential skills and exercises that set the Meisner-Training apart and make it the most modern acting training. Here as well you have the choice of a core or full-time program (see year-long for more information above). After the eight weeks there might be the possibility for you would you wish so to join the year-long. This 5 day workshop, six hours per day, is aimed at giving you a foundation for your acting that is alive and happening in the moment. We will train the necessary skills to be truthfully engaged and open to receive to react in the moment. You will experience transparance and freedom in your acting while being connected to your emotions. This wekend is an introduction into the Meisner-Training and we will practise the fundamental qualities in every good acting experience: listening, reacting from your true impulses from one moment to the next. Towards the end we will look at how that applies to scenework: the reality of doing under imaginary circumstances.